BEIJING, Sept. 27 (APP): While supporting President Xi’s advocacy for cooperation and collaboration in terms of ensuring national security, Federal Interior Minister Ahsan Iqbal said that this vision of shared responsibility and shared concern for everyone is needed at this time. 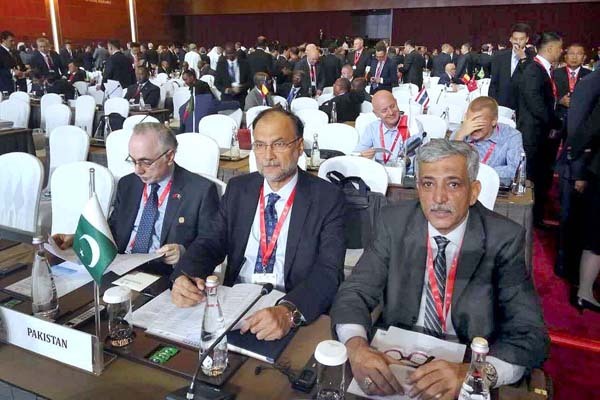 Ahsan Iqbal who represented Pakistan at the opening ceremony of 86th General Assembly of Interpol here told China.org.cn that around 70,000 Pakistanis have been killed as a result of terrorism during the past decade, making Pakistan the greatest victim of terrorism over this period. But in the last four years, the country has amassed experience in fighting terrorism, and is willing to share it with other countries. “We look forward to working very closely with China as well as our friends in other countries to create a safer world, not just in our region, but around the whole world, so that we are able to cooperate to deal with new challenges like drug trafficking, cybercrime, technology-driven crime,” he added. “Therefore President Xi’s offer — to help developing countries establish abilities in fighting new types of crime through training police and through capacity building of security agencies — is very timely and much appreciated,” he continued. In his speech, the Chinese president vowed stronger support for Interpol in the five years to come to raise its global influence and leadership.